Hello! Today is a packed post for Lawn Fawn September Inspiration Week. I have lots of projects to share so I will get right to it. My first project is a card with the new Winter Alpaca mini set. This little guy is super cute, I colored him with colored pencils and cut him out with coordinating die. I tried using some different colors for this winter card by adding a little pink to the mix. My second card uses the new Scripty For You die and as well as the Stitched circle tags. I cut the sentiment and heart from silver glitter paper. I used some adhesive backed glitter paper from Tim Holtz. I added a little pattern to the smaller red cardstock tag to create a little contrast between the two. The trees on the bottom are from the Ready, Set, Snow set and I hung the tags with red sparkle twine. I cut the sentiment and heart from silver glitter paper. I used some adhesive backed glitter paper from Tim Holtz. I added a little pattern to the smaller red cardstock tag to create a little contrast between the two. The trees on the bottom are from the Ready, Set, Snow set and I hung the tags with red sparkle twine. My final projects for today's post uses the Santa's Belly add-on die for the Pillow box. I wanted to stretch the use of the dies from just Santa's Belly so I created and Elf and Snowman (which was my sister's idea). I only used pieces of the die cuts for each of these. I used a strip from the bottom of a 12x12 sheet of Let's Bokeh in the Snow paper for the Elf's buttons and added a teddy bear from Pa-rum-pa-pum-pum. For the snowman I used the strips that typically got down the center of the box to create tails of the scarf adding a little piece of paper with a scallop detail to the ends. Thanks for stopping by today, be sure to check out the Lawn Fawn blog for more projects with these products! Especially check out what Elena did with the Santa's Belly die...just brilliant! Please don't tell the other stamps, but the alpaca is my all time favourite. 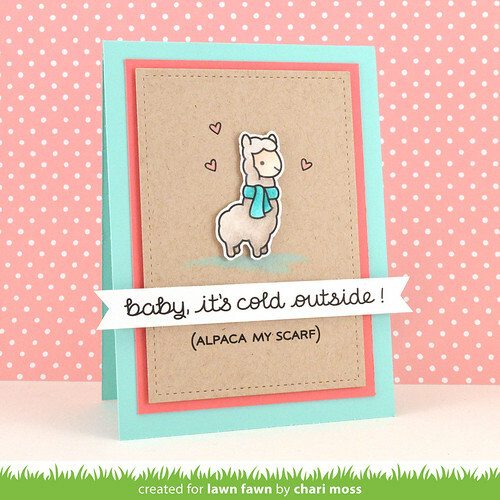 Your alpaca card is sooo incredibly gorgeous, the colours and the clean layout. Absolute perfection. I love the colors you used on your alpaca card, they go so well together!! Your pillow box projects are super cute! Thank you for the inspiration! WOW Chari, what awesome projects! Great work here! Ohhh these are sooo cute!! !